It's OK, sometimes I don't mind at all being wrong. (02-16-2017, 03:38 PM)tomh009 Wrote: It's OK, sometimes I don't mind at all being wrong. I do know where you were coming from with your initial thoughts however. We bought a semi from the same builder and some people thought we were crazy at the time. But in hindsight, I think we will do very well moving forward. While the prices per square foot are definitely higher than many builders, the quality of construction and finishes is in line with the initial outlay of cash. Damn! Apparently I'm going to demolish my house and replace it with 4 town homes and then retire to a mansion. I'm really curious about those proposed semis on Bismark. The style is not my cup of tea, but I think it might add something interesting to the neighbourhood. And, as I've said, a diversity of building types and ages is in everyone's interest. (02-16-2017, 04:51 PM)danbrotherston Wrote: Damn! Apparently I'm going to demolish my house and replace it with 4 town homes and then retire to a mansion. Good luck on getting the rezoning. You'll make enough to pay for your contractors/construction, and your own living expenses for the years it will take to make it happen. The Walter street semis were two sets of semis on two lots. If you have a forty-odd-foot lot, you sure can demolish your home to build two semis which will apparently sell for approaching $600,000 each. No rezoning, or even variances, required. (02-16-2017, 06:53 PM)MidTowner Wrote: The Walter street semis were two sets of semis on two lots. If you have a forty-odd-foot lot, you sure can demolish your home to build two semis which will apparently sell for approaching $600,000 each. No rezoning, or even variances, required. If the zoning allows semis. Yes, zoning is that absurdly specific. In fact, I recall a townhouse development which had to get a zone change to allow one of the buildings in the development to have only two units in it — in other words, to be a semi, not allowed as of right in the area zoned for townhouses. Another factoid: the Waterloo zoning bylaw refers specifically to “picture framing” businesses. Need I say more? Yep, zoning can be bizarrely specific sometimes. But Walter Street and nearby neighbourhoods (there are small pockets zoned differently) allow semis as a matter of course. The setbacks would be the concern, but they are not extremely onerous (1.2 meters from the side lot, I think). That's great that they're intending to clean it up, but it doesn't sound to me like the problem lies with the tenant. If he has a lease until the end of July, there is very little they can do (I mean legally) to have his apartment vacated by April. The tenant says he would vacate if he gets a written commitment for three months' rent -- so it seems an easy problem to solve. It's also interesting that Stephen Litt is involved, his company /former company Revel Development gained a bit of a reputation for not always wanting to play by the rules. (02-26-2017, 10:33 PM)rangersfan Wrote: It's also interesting that Stephen Litt is involved, his company /former company Revel Development gained a bit of a reputation for not always wanting to play by the rules. The renting experience I encountered with them was by far the worst of any "professional" landlord I've encountered in the area. Mould, vermin, the tenancies act; I don't think I ever found something they weren't all too happy to ignore. 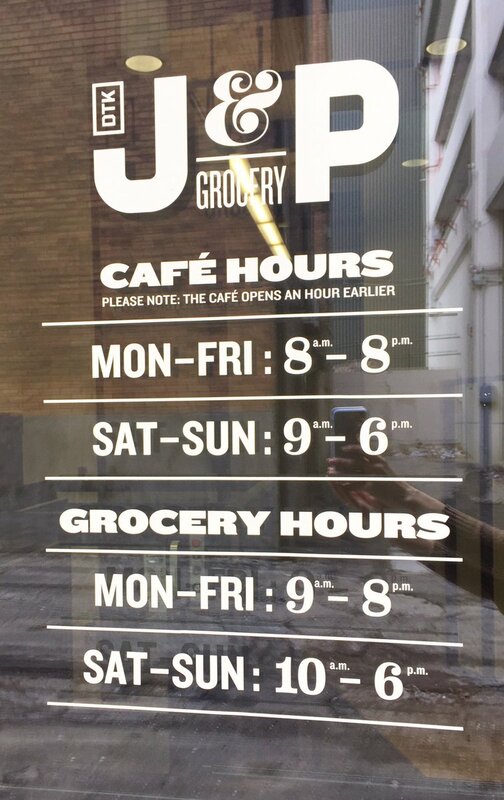 J&P Grocery is getting ready to open! The Benton Urgent Care Clinic is getting close to opening, albeit almost six months behind schedule. Interior work appears to be largely complete, could possibly be finished this month. No indication of an opening date yet, though. It appears that there is a demolition fence around the two houses on the south east corner of Moore and Wellington. According the Kitchener permit system the properties (26 Moore Ave and 43 Wellington St N) are owned by Perimeter Development Corp, but I can't tell if the demolition permits have actually been issued or are still pending.